Ambassador Karin Olofsdotter (right) shares fika and conversation with Gustavus students. 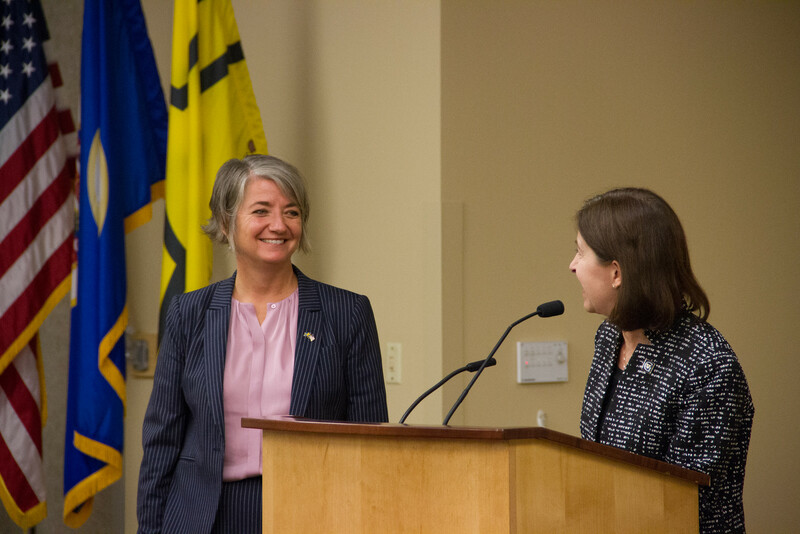 The Swedish Ambassador to the United States, Karin Olofsdotter, visited Gustavus Adolphus College on Monday, September 17, as part of her three-day trip to Minnesota. During her time on campus, Olofsdotter hosted a public lecture in the Jackson Campus Center, which nearly 100 people attended. The audience, made up of Gustavus students, staff, and members of the Saint Peter community, piled in to experience an intimate discussion with Sweden’s top U.S. diplomat. Olofsdotter opened by asking the members of the audience to raise their hand if they were of Swedish descent. “We are probably related!” the ambassador joked, explaining that nearly a quarter of the country’s population immigrated to the United States in the late 19th and early 20th centuries. Swedish Ambassador Karin Olofsdotter and Gustavus President Rebecca M. Bergman. As the United States and Sweden celebrate 200 years of international relations, Olofsdotter updated the Gustavus community on the state of affairs in Europe today. She spoke about the recent Swedish elections, the country’s balance of individualism and social welfare, taxes, immigration, and trade. Olofsdotter stressed the importance of Sweden and America’s transatlantic link as well as concerns the country has with proposed U.S. tariffs on European goods, pointing out the massive effect that foreign policy can have on smaller nations like Sweden. 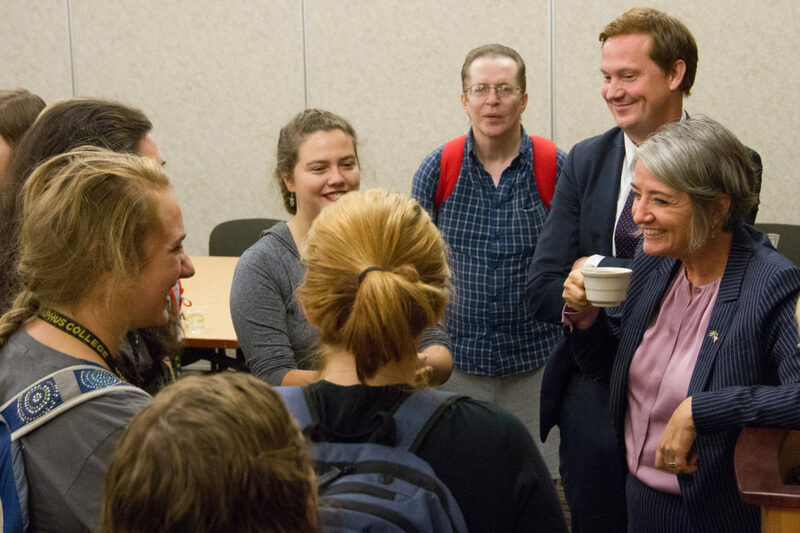 After her prepared remarks, Olofsdotter answered questions from the crowd before sharing fika, a Swedish coffee break, with students and staff. Following the open session, she toured the campus with Scandinavian Studies and history professor Glenn Kranking and lunched with President Bergman and invited guests. The visit to campus was facilitated by Bruce Karstad, the president and CEO of the American Swedish Institute in Minneapolis. The warm and approachable Olofsdotter is Sweden’s first-ever female ambassador to the United States, but she’s no stranger to the country. This is the fourth time she’s lived here, including stints as an exchange student and in graduate school. Olofsdotter’s primary focus as ambassador is to maintain and strengthen the strong bonds between Sweden and America, so trips like this help deepen her understanding of American culture so she can relay her knowledge back to the people of Sweden, she explained. And her analysis? “I think we are very much alike,” the ambassador said.